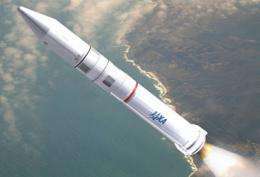 (PhysOrg.com) -- In order to look at trimming costs when it comes to rockets, researchers in Japan are looking to create a smart rocket. With the use of artificial intelligence, they hope to create a rocket that can diagnose, and in some cases even repair, its own system malfunctions. As the project manager for the current Epsilon launch and a professor at the Institute of Space and Astronautical Science at JAXA, Yasuhiro Morita is leading the push for the artificially intelligent rockets. Current rockets are equipped with onboard sensors, but these do nothing more than make ground control aware of the problems the rocket may be experiencing. Similar to an automobiles check engine light, this does nothing more than give an alert to a problem. The goal of artificial intelligence use in rockets will be to not only identify a problem, but to provide solutions and, when possible, fix the problem onboard. The new Epsilon rocket hopes to use some basic artificial intelligence in its proposed maiden voyage in 2013. The idea being that Epsilons sensors will function much like a brain, diagnosing the problem and cause of a malfunction, and implementing a possible solution. In an example, researchers discuss the electrical currents that work to control a rockets main thrusters. These thrusters control the rockets direction, and should there be an electrical surge, the rocket is moved off course. The new Epsilon rocket would be able to protect against these surges, or in the case of a surge, correct for it and maintain the rockets course. The ability for these smart rockets to perform their own tests and needed maintenance also opens the ability to cut current costs and manpower needed to operate a ground control team. Current mission control teams are composed of dozens of people in a large facility. The hope is that by using artificial intelligence and electronic communication, the mission control teams could be reduced to just a handful of people operating on laptops and not the current large computers used. With many people concerned with the idea of artificially intelligent rockets controlling themselves, Japans researchers are taking the addition of artificial intelligence slowly. The idea of possible rockets which are able to control their own guidance and complete flight performance will not be looked at for several years into the program. Hmmm, given the number of glitches and problems JAXA has, and is, having, it would do well to steer away from fuzzy AI systems. Get the basics right and reliable before adding additional unproven complexity. Or if they REALLY want to implement this, slap it on a proven and reliable booster like whatever it is the Russians use or one of the Delta rockets. Yeah, brilliant. In stead of keeping all the computer equipment on the ground, where it can be used many times with zero risk, let's place a complex computer in each rocket. This is a good example of somebody with zero critical thinking skills. If this guy has a budget, I'm scared. If we're lucky, maybe we can tripple the cost of each launch!! Now we're talking like a government agency! Spend baby spend.